Children learn best by seeing adults setting good examples. From Nogales St., take Villa Clara St. onto Lerona Ave., follow the orange cones to enter the driveway. Do not cut through the parking lot to get into the traffic line. Do not make any U-turn on Lerona Ave.
Do not walk across the U-drive, please use the sidewalk. Park on the street if you need to leave your car. Do not drop off or pick up your child in the parking lot or on the street. Hold your child’s hand at all times. Please remain in your car, move forward as other vehicles proceed for proper use of the U-drive. Please do not use the cell phone when dropping off or picking up children in the U-drive. For students taking ACS transportation, please notify ACS office for any schedule changes ASAP or at least one day ahead of time. We will try our best to arrange for early pick-ups. However, there are times that ACS transportation is unable to meet early pick-ups, parents are fully responsible for the pick-ups. Do not block the exit or the entrance of the parking lot and the U-drive. 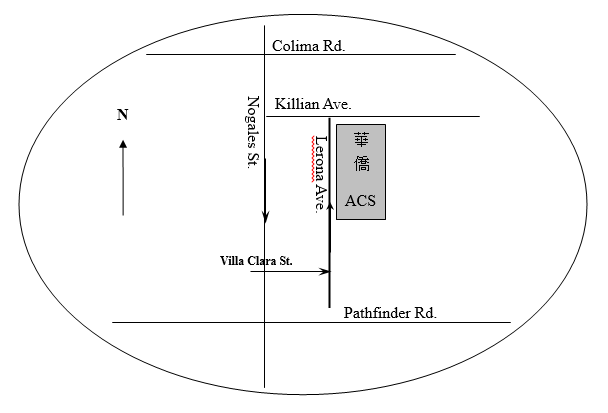 When you drive north on Lerona Ave. towards Killian Ave., making a right turn may be easier if turning left is not available immediately. Help to keep the traffic flow smooth. Assist the staff on duty by following their requests. Please go over the above rules with anyone who will pick up/drop off your child for you. For the safety of your child, you are required to come to the office (Room C-1) and fill out the sign-out form for all early pick-ups. This is the easiest route.